On Mondays it is fun to practice flower arranging by joining in Cathy’s weekly challenge In A Vase On Monday. 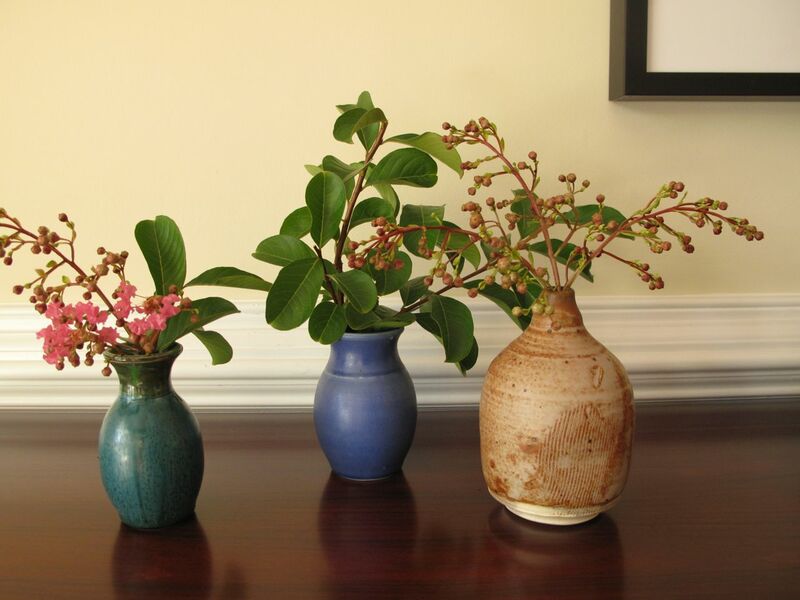 The goal is to fill a vase using materials gathered in one’s own garden. My plan this week was for a simple vase. The two Lagerstroemia (Crape Myrtle) at the end of the front walkway had begun blooming last week. I thought I could quickly snip an inflorescence early this morning and drop it the new blue ceramic vase my sisters gave me this spring. But once outside I saw that four branches of the tree, weighted down by the heavy flowers, were overhanging the sidewalk. This ruined my plan for quick simplicity, because I trimmed those branches back and ended up bringing lots more flowers into the house than I needed. 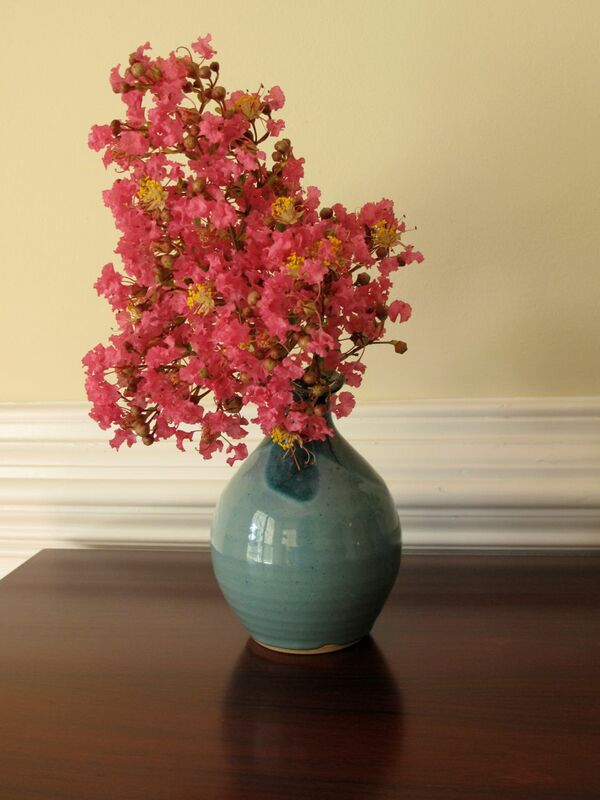 I began implementing my original idea for today’s arrangement and soon decided the shape and color of the beautiful vase I had chosen did not complement the form of this Crape Myrtle with its pinky-pinky tone. 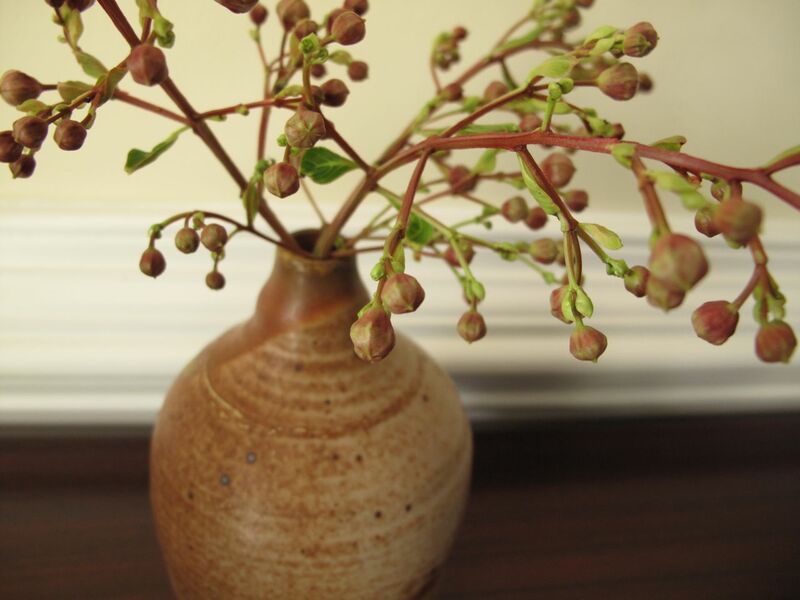 The condition of the flowers was not as fresh as I had expected—petals were already fading and seed pods were forming. Also I was surprised by how much yellow was visible in the flowers and found it distracting. More interesting to me were the component parts of the Crape Myrtle and I began dissecting the flower heads and stems. I filled a variety of containers, one with the berries, one with leaves, others with combinations. In the end I made a more formal design as well which turned out to be my favorite individual arrangement. My quick idea for today’s vase turned into a more detailed and interesting study of the characteristics of the Crape Myrtle. A collection of vases is something I think works well under many circumstances, using a combination of materials or, as in this case, just one plant. 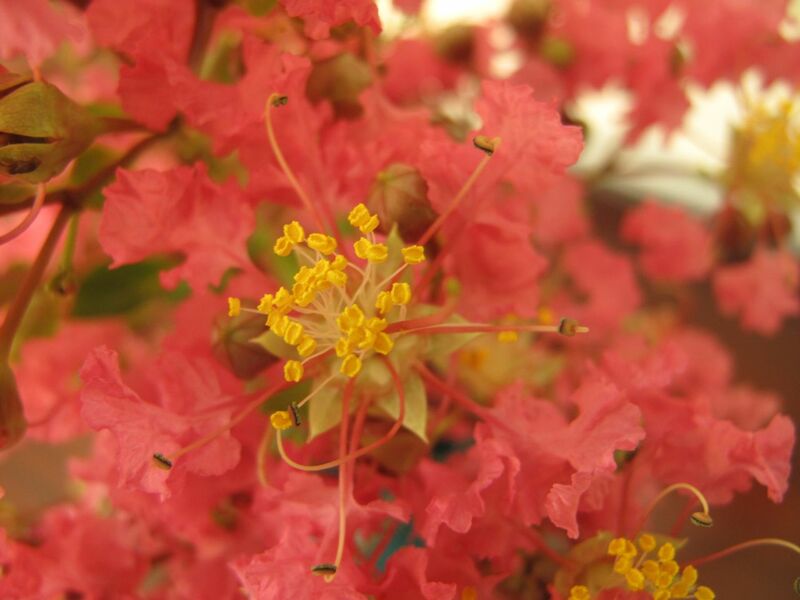 This entry was posted in garden and tagged flower arranging, flower design, in a vase on monday, Lagerstroemia (Crape Myrtle), nature photography on June 30, 2014 by pbmgarden. It is fun to have a collection of vases; I like the collection as well as the more formal arrangement. I do enjoy your style of arrangements very much. Again your Lagerstoemia is far in advance of mine, which I hope will produce a few more flowers this year. So beautiful, I like the last photo most of all, it has a Japanese feel to it, beautiful! Thank you Pauline. I was happy with that arrangement. I fell in love with crape myrtles the first minute i saw them when i moved to Fl. Such a pretty, full bloom! When crape myrtles bloom it certainly feels like summer around here. I’m finding it hard to stick to one idea with these Monday vases–one thing leads to another. What an interesting story for such a simple task. It sure did take on a life of its own! I like what you ended up with and it’s quite the study in crape myrtle. That’s one plant I wouldn’t mind growing up here… if only it could without too much trouble. The moral of this post is that it’s hard to keep things simple! 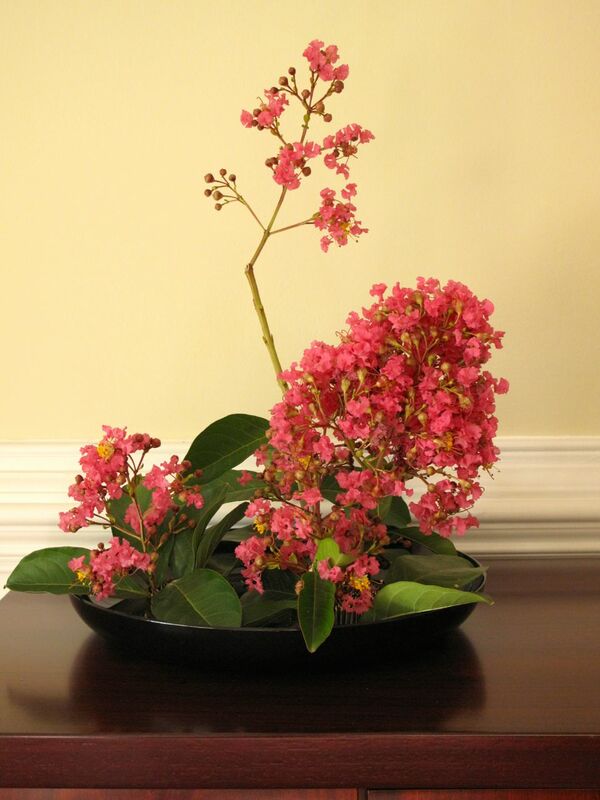 Crape myrtles are ubiquitous in this area and you can get them in a range of sizes. A study in Crape Myrtles – I love it! Kris, Crape Myrtles turned out to be more complex than I suspected. I love your last formal arrangement. Yes I agree – it does look Japanese. Thank you Annette. That one is my favorite too. Absolutely lovely. These postings are always a delight to receive. Such fun! I like the line up! Thanks Marian. It was a lot of fun to experiment with the crape myrtle. Oh what a good idea, even though it wasn’t what you planned! I love the idea of disassembling your pickings like this (this is the sort of thing primary school children have to to do for design and technology these days – not just making but disassembling first!). I am in awe of the whole impromptu concept, Susie, and even though I admire the last display I like the grouping even more. Isn’t it wonderful the journey this meme takes us on?! 🙂 Thanks so much your all the inspiration you have contributed over the last few months. That’s a lovely idea to have several vases together, all complementing each other. Very nice Susie! Thanks Cathy. It’s fun to make each vase a little different but overall they work together. Your Crape Myrtle reminds me the one we had, many years ago, when we lived in Dallas, TX. Fantastic arrangement!! 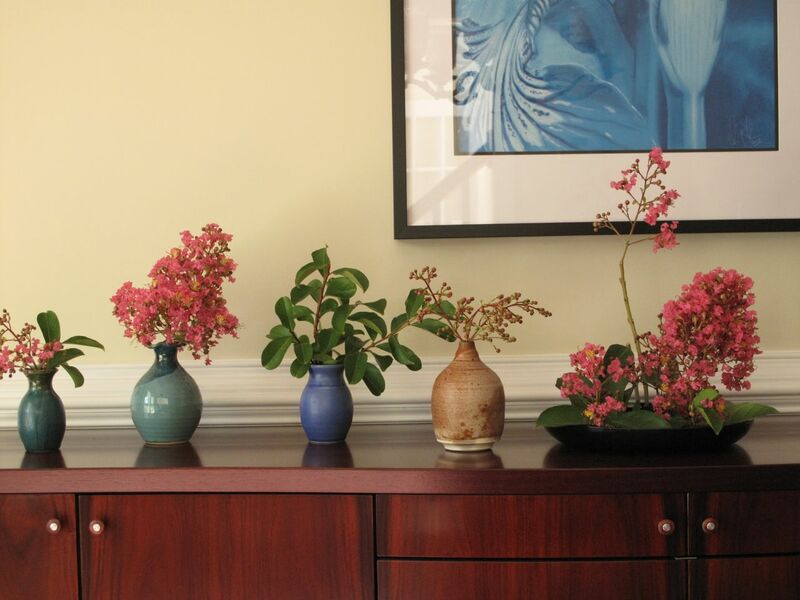 The Crape Myrtles are pretty, and the vases look very good together. Thanks Jason. Do Crape Myrtles grow in your area? Beautiful, the same plant, but you have made them all look so different. The last one does inded look very Japanese. I love it. You never see this lovely plant here, is it hardy? Hi Chloris, Wikipedia says crape myrtle is hardy south of USDA zone 6 (from −23.3 °C (−10 °F)	to −20.6 °C (−5 °F)). This came from China originally but there are lots of hybrids now, one for every situation. Fabulous vases and so creative!